Whether your marketing landing pages are hosted on the same domain as your website or live on a separate domain, there are a few best practices that you should follow to make sure you’re accurately tracking landing page performance, conversion, and attribution. In almost any industry, companies use dedicated marketing landing pages to drive traffic towards a specific objective or ultimately increase traffic to your website. Marketing landing pages are typically targeted to certain audiences and focused on encouraging specific actions. Maybe you have a team of internal designers and developers who build your landing pages, or maybe you pay an outside vendor to create them. Either way, a lot of resources can go into developing many different variations of those landing pages, so it’s important to track these properly in Google Analytics with your actual site. Since landing page construction and testing is often a separate process or sometimes even separate team from the main website, there can be a temptation to track these pages into a separate Google Analytics property. It’s easy to set up a new property and sometimes we can just get that done without bothering anyone else. Perhaps another company or tool is helping with these landing pages, so they’ve suggested setting up separate tracking or even gone ahead and taken care of that for you. That’s fine – but it’s just not the best. For several reasons, we want your landing pages to be tracked together with your main website. That doesn’t mean you can’t also have separate tracking on there; it’s totally fine to have multiple Google Analytics properties tracked on the same page. In the examples below, we’ll talk about some of the common types of marketing landing pages. Specifically for pages that include links or call-to-actions that take the user back to the main website, you’ll want to make sure all of that traffic is tracked together and attributed properly. This is so important because often we spend more money and time driving traffic to our landing pages, so we want to make sure those campaigns and traffic sources get the credit they deserve. In addition, this extra setup work will help prepare you for the fun stuff that comes next – things like using Google Optimize to test and tweak your Landing Pages! Landing Page Challenge: What’s the Point? Take a good look at your landing page and determine what it takes to call this page a success. Likely you’ll have something you want a person to do, referred to as a call-to-action, like Submit This Form, Watch This Video, or Call Us Today! The next question is how will you be able to report on whether the landing page was successful? Or, how will you be able to tell which traffic source was more successful? 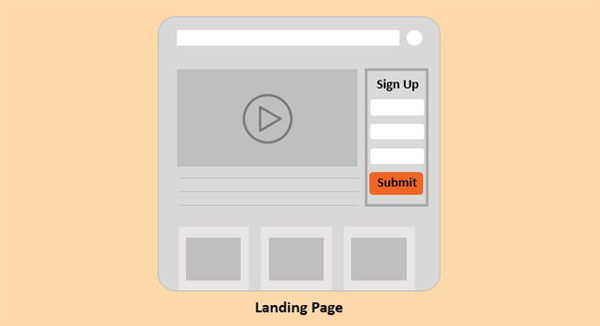 Let’s go through some of the common goals for a landing page. If the goal of your landing page is to drive people towards conversion on this particular page, such as submitting their information through a form or clicking on a high-value call-to-action button, then your number one job is tracking that engagement on the page itself. Remember that Google Analytics only measures page load by default. A common anecdote from training attendees and clients is that their landing pages have extremely high bounce rates. Well, if everything happens all on the landing page, then Google Analytics only knows that they loaded the page, not what else happens after the page loads. Of course you’ll have a high bounce rate if they’ve only loaded one page. These will help separate users who arrived on your page and left immediately versus those that arrived and did the thing you care about. Check out our Google Tag Manager recipes, designed to help make it easier to track these types of interactions. Specifically for the important ones, like filling out a form, you would want to track these into Google Analytics with Events, then set these up as Goals inside of Google Analytics. Remember that you have 20 separate Goals per View, so it may be helpful to split your landing page traffic into its own View if you want to define custom Goals. You should always measure some kind of high-value interaction, because otherwise, why have targeted landing pages? Put them to work. Here’s a common challenge – what if one of the goals (or the only goal) of your landing page is to get people to the main website? How can we prove how effective this is? Take care in how you set up your Event Category, Action, and Label to make sure you’ll have exactly what you need after everything is tracked and that you’ll be able to reuse some of those for your next landing page. While yes, you want to know how people move from your landing page to your main site, you want to be careful to not confuse this with your Traffic Source reporting. Remember, your Acquisition reports in Google Analytics are answering the question “Which traffic source should get credit for this particular session?” If you’re using Google AdWords, social media, or targeted email campaigns to drive traffic to your landing page, and then ultimately to your main site, then you want to see those traffic sources in your main site’s reporting. You don’t want to see the Landing Page as a traffic source. This means we need to set up our tracking properly so that we 1) track the same user from our landing page to our main site and 2) maintain accurate traffic sources. We do not want to see these landing pages show up as referrals to our main site. And here’s another big one, do not add UTM parameters on links to your main site from your landing pages. This will cause your current session (from whatever traffic source) to end, and start a new session from your landing page, making attribution reporting more difficult. Landing Page Challenge: Where Does it Live? 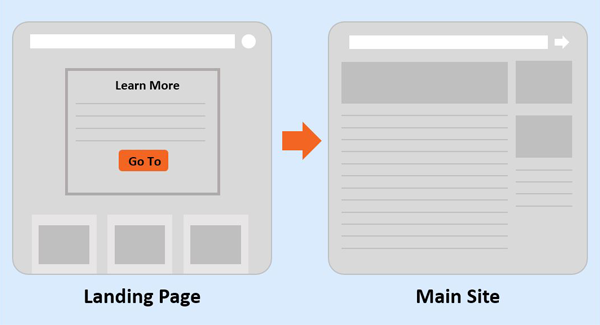 Often, marketing landing pages live on the same domain as your website. Even if they use a separate template from the other pages on your site or are even built on a separate platform if the address of these pages looks like they’re on the same domain, how they were built doesn’t change how we’ll track these pages. Where a page lives will change the steps needed to set up the correct tracking and to enable easy reporting. As you consider Analytics and reporting, the easiest and best scenario would be to place these pages in their own subdirectories, like www.example.com/promo. Trust us, this will save time and headache. Pages on the same domain will automatically be able to share cookies with the rest of the website, so all you need to do is make sure you have the same Google Analytics tracking ID on this page. If you need to report on these separately, they’ll automatically be split out in the All Pages or Content Drilldown report, and it’s easy to create a new View inside of Google Analytics with a subdirectory filter to monitor the success of these pages. If your landing pages are on a subdomain, like promo.example.com, that’s fine – but it will take a little more work. If users go between the landing page and your main site, you’ll want to follow the instructions to make sure your Subdomain Tracking is set up correctly. Note that with the appropriate subdomain tracking set up, you will not see referrals from your subdomain to your main website. This is a good thing! While it may have been an easy way to measure how much traffic came from your landing page to your main site, instead, you’ll be able to more easily see the original source information, like the campaign that brought them to your landing page in the first place. We talked above about other ways to measure landing page traffic to the main site. Additionally, you’ll have a reporting challenge if you combine this with your regular tracking. When you go to report on the success of this landing page, your All Pages report in Google Analytics may combine this landing page together with your main site’s home page. Remember that the All Pages report by default just shows the Page Path, so if you have www.example.com/ and promo.example.com/, they’ll both show up in your All Pages report as /. You can fix this by either faking the Page parameter in your tracking and passing in a fake page name, like /promo, or by using an Advanced Filter on your View to alter what values appear in the page path. If you’re building marketing landing pages through another platform, such as Marketo, Salesforce, or Hubspot, sometimes these pages will actually be hosted on a different domain, for instance, your website might be www.example.com and your landing pages might be on www.bestwidgets.com/promo. By itself, this isn’t a problem. However, remember above when we talked about the goal of your landing pages. If your landing page links directly to your main website and especially if your main goal is to drive traffic to your main site, then it’s imperative that you have cross-domain tracking correctly in place. Basically, from a tracking perspective, you want to treat your landing pages just like any other page on your website and you want to make sure the users are counted as the same user throughout their entire journey. Do I Need Cross-Domain Tracking? With cross-domain tracking properly set up, Google Analytics will share cookies as a user moves from the domain with your landing pages to your main website domain (don’t forget that you may also need to add both domains to your Referral Exclusion list in GA). This will provide you with correct attribution reports. Lastly – just another note of caution here. If your landing page appears looks like the following, www.bestwidgets.com/ or promo.bestwidgets.com/, then you may have one additional consideration. Since it’s on an entirely different domain, you’ll want to set up cross-domain tracking, just like above. However, when you go to report on the success of this landing page, your All Pages report in Google Analytics may combine this landing page together with your main site’s home page. Remember that the All Pages report by default just shows the Page Path, so if you have www.example.com/ and www.bestwidgets.com/, they’ll both show up in your All Pages report as /. You can fix this by either faking the Page parameter in your tracking and passing in a fake pagename, like /promo, or by using an Advanced Filter on your View. Ultimately, marketing landing pages can be extremely valuable for getting your target audiences to do what you want them to do, from providing you with their contact information to encouraging them to explore more pages on your main website. But you need to take a few extra steps to ensure that you’re tracking engagement properly and maintaining traffic information, so that you’re able to measure your landing pages’ effectiveness and use those insights for future efforts.